TAGHKANIC (COLUMBIA COUNTY)—Working together with the Zapp family, Scenic Hudson, Columbia Land Conservancy (CLC) and Equity Trust recently protected the 83-acre Delapenta Farm in Taghkanic. 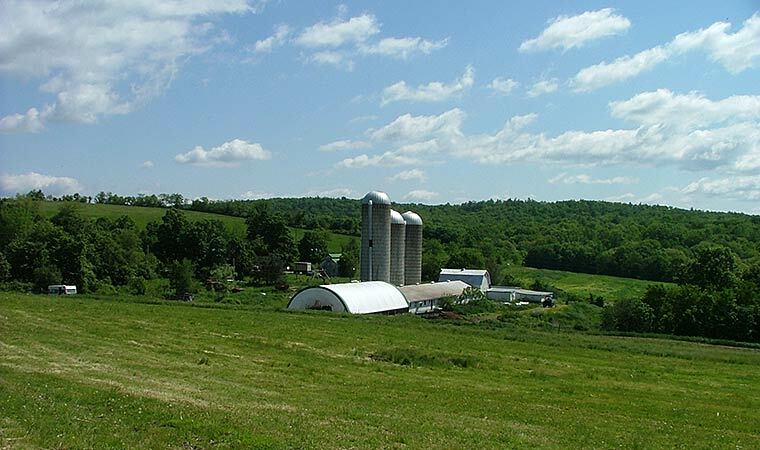 By acquiring a conservation easement on this third-generation dairy farm, the groups ensured the land’s permanent availability for agricultural use. An innovative provision in the easement will keep the land affordable for future farmers. In operation since 1913, Delapenta Farm’s Holstein operation provides milk to the Northeast Dairy Producers Association cooperative. The land consists of more than 40 acres of USDA Prime farmland or Soils of Statewide Importance and is adjacent to other land previously protected by CLC. Scenic Hudson paid the farmers a portion of their land’s value to ensure its permanent protection through the conservation easement. Simultaneously, Equity Trust’s Hudson Valley Farmland Affordability Program purchased a Pre-emptive Purchase Right (PPR) on the farmland. This resale restriction gives CLC the ability to ensure that all future sales of the land will be to farmers at agricultural value. By granting a PPR the Zapps not only ensured the land’s permanent availability for agricultural use but provided long-term stability for their own operations. Funds from the conservation easement and PPR will support the family’s plans to transition to an all-organic operation and enable them to update dairy infrastructure and invest in on-farm processing of their milk for direct sale to local and regional consumers. Scenic Hudson purchased the conservation easement with funds from the organization’s Lila Acheson and DeWitt Wallace Hudson Valley Land Preservation Endowment. Scenic Hudson Assistant Land Conservation Director Cari Watkins-Bates negotiated the transaction in partnership with CLC’s Acting Director of Conservation Programs Marissa Codey. CLC will hold and manage the easement. Conserving this farmland was a priority of Scenic Hudson’s NYC/Hudson Valley Foodshed Conservation Plan, a blueprint for ramping up collaborative farmland-protection efforts to create a secure source of fresh, local food for the Hudson Valley and New York City. The transaction also accomplishes priority conservation goals of CLC. “This partnership between Scenic Hudson, Columbia Land Conservancy, the Zapp family and Equity Trust means the Delapenta Farm’s high-quality agricultural land always will be available for supplying fresh, local food to consumers in the Hudson Valley and New York City. It also provides capital for the Zapp family to grow their operations,” said Steve Rosenberg, executive director of The Scenic Hudson Land Trust. “The protection of Delapenta Farm is the culmination of years of work and is a tribute to patience, perseverance and the Zapp family’s commitment to farming. While the technical challenges of this project were immense, the outcome is simple—another hard-working Columbia County farm family has been given the opportunity to continue doing what they love—farming. And for that we are enormously grateful to our partners at Scenic Hudson and Equity Trust. Their investments in the county will yield a future from which we will all benefit,” said CLC Executive Director Peter Paden. Inclusion of a resale restriction in the easement ensures that the land will remain in active agriculture through any future sales. Equity Trust worked closely with Scenic Hudson and CLC to develop this provision, until now rarely used in New York State easements, in a form satisfactory to all parties. “We are very grateful for the opportunity provided to us by Scenic Hudson and the Columbia Land Conservancy. Agreeing to the conservation easement and the PPR was a win-win in our opinion. It ensures that our farmland will be protected in the long term, and it has provided us with the capital necessary to continue providing local milk to consumers. Each year more and more valuable farmland is lost to development, so we are glad that we will not be adding to that statistic,” said Michele Zapp. Previous collaborations between Scenic Hudson and CLC have resulted in the protection of more than 2,600 acres of productive agricultural land on 21 working family farms. This transaction is part of Scenic Hudson’s collaborative campaign to Save the Land That Matters Most and supports the goals of the organization’s groundbreaking Foodshed Conservation Plan (www.scenichudson.org/foodshedplan). Conserving agricultural land through conservation easements provides current farmers with capital to invest in their operations and makes it more affordable for the next generation of farmers. It also supports the viability of agriculture-related businesses and helps secure the region’s agricultural vitality, which contributes substantially to the Hudson Valley’s $800-million agricultural and $4.75-billion tourism economies. Conserving farms also is a buffer against rising local property taxes: Studies have shown that farms contribute more in taxes than they consume in tax-paid services. Over the past 17 years, conservation easement programs in the Hudson Valley have put more than $100 million directly into the hands of farmers. This investment has allowed agriculture to continue to thrive, advanced new opportunities for young farmers and allowed farmers to invest directly in their operations. At the same time, it has benefited communities. According to the American Farmland Trust, for every $1 invested in farmland conservation, $4 is returned to the local economy.